Ah, I love the smell of TMA due dates in the morning. It smells like … Desperation. This morning’s desperation is caused by the due date of TU100’s TMA05, which requires input from others to complete. I hear there’s actual collaborative work going on in TM129, so this isn’t as bad as that, but it’s still enough to have some rocking back and forth and drooling. So what’s going on? What’s the big deal? As mentioned previously, TMA05 requires us to create a video (or audio) presentation. This is enough to get under most people’s skins, but they probably should have been prepared for it. The more insidious part is that we have to offer feedback on two other presentations, and we have to evaluate the feedback given on our own presentation. Which means that we’re at the mercy of other students to complete the assignment. Huh. I thought that would end up being a circle. Okay, it’s the Linear Sequence of Strife. Yes, it’s unfair. Yes, your performance will end up partially based on what others around you do or don’t do. 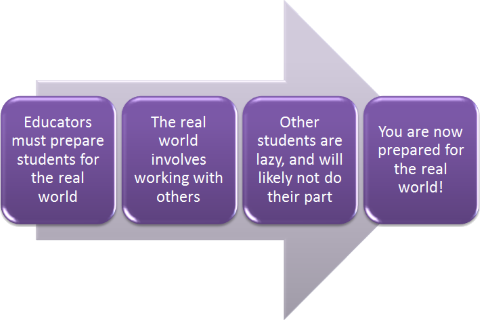 Educators can choose to set you up for failure in the real world by either not including group work, or by including it but not marking you down for other people’s suckitude. Or they can help you get used to it early. With the Apprentice mechanism, you don’t worry so much about the overall end result. In fact, the brighter the flames are in which it goes up, the less attention will be drawn to you. As we’ve all learned by leaving the TV on when this show comes on, the plan here is simply to look for the nearest bus, and figure out which of the people around you is lightest, and therefore easiest to throw under it. Ostriches don’t actually stick their head in the sand. That doesn’t fit my narrative, however, so Imma ignore it, and pretend they do. You can likewise just stick your head in the sand, ignore the fact that everybody else is doing as much on the project as Simon Cowell’s girdles are to fool anyone, and just get your part done. You could just try to rally everybody else into doing their part. Good luck. We’re all behind you. My personal mechanism is the Facilitator. I get my part done as early as humanly possible, and hope that makes things a bit easier for everybody else. If they’re not waiting on me, it’s one less excuse they can kick their legs up and rest on. In reality, you’re likely going to have to hope for the Tag Team. This one holds out for the chance that there’s at least one other person on the project that’s in the same position. Together, you start early, play the Cheerleader, take the whole thing on your shoulders, ignore what isn’t being done, and when all else (and the project) fails, you check your phone for bus schedules. The Tag Team worked well for me this time. I got the TMA in about two weeks ago after three or four of us all commented on each other’s presentations. I’m expecting one or two points off for including a chart in landscape instead of portrait orientation, which someone has said got them marked down in a previous TMA, and probably two points off because my presentation expanded from the maximum allowed 90 seconds to 91 seconds when it was processed through the module’s transcoder. So hopefully between 94 and 97 this time. I’ll know in one or two weeks, and then I’ll post the presentation with my personal details scrubbed. 2017/3/31 Edit: I thought I’d have at least a week to redo my title page before posting up the presentation. Nope! I got my TMA back in just three days. Clearly my tutor has gone a bit loopy from trying to get it all done so quickly, so I ended up with another generous full 100 marks. I’ll take it! As usual, it came with some great feedback for future reference. I’ll discuss what the numbers look like now when I’m ready to move onto the de facto EMA. This was my presentation. As with the Shakespeare video linked above, that’s just my voice on the video, and not a speech synthesiser as was suggested in my feedback. Heh. Please see acknowledgment credits for details of components used here with permission through various Creative Commons licenses. Previous Previous post: Nearing the end of TU100 on Q62 – What’s next? Nice! And it even uses the learning! Likewise, we could hope for Critical Mass and let all cluster members comment on presentations. Our tutor group had all of five people leave comments. Same here, well expect for the OMG-less-than-a-week-to-go-better-leave-one-line-of-C+P-feedback brigade. Still it left plenty to discuss in Q2(c) and I got to give ShareSpace a kicking too!